Emma Stone and Rachel Weisz are perfectly paired as cousins, Abigail Hill and Lady Sarah, Duchess of Marlborough, well-spoken, conniving rivals as Queen Anne’s confidants and intimates; Olivia Colman sears as the 18th century monarch, debating England’s most legitimate solution, in its relationship with France, war or peace. 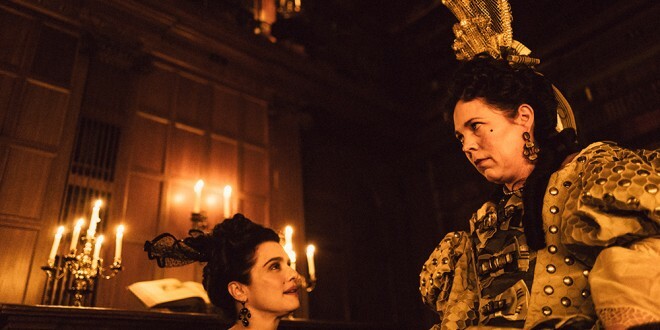 Controversial director Yorgos Lanthimos (“Dogtooth”, “Lobster”, “The Killing of Sacred Deer”) in “The Favourite”, his most accessible film to date, presents a ménage a trois, a trinity of feminine intrigue, manipulation, duplicity complemented with loyalty, honesty and love. Lady Sarah (Weisz) brilliantly rules in Anne’s stead; fiercely protective of the Queen’s deficiencies, while engineering affairs of state, daunting intelligence and resolve peppered with gaiety and iconoclastic diplomacy, is a devastating, unchallenged force until the arrival of Abigail (Stone), a “lady” of reduced circumstances, through superlative chicanery, and insightful perspicacity, temporarily topples her rival; Anne’s complexity, pain, isolation conclusively proves “uneasy is the head that wears the crown”; she has seventeen rabbits, surrogates for the number of children she bore and lost; Coleman’s performance borders on the sublime. Writers Deborah Davis and Tony McNamara’s script is sharp-witted, fashionably “tony” and delivered with alacrity by seasoned, consummate actors. The musical score’s repetitiveness, at times jarring, ultimately contributes to the tension-infused progression of the scenario. Hours after viewing, one line resonates: on departing from the palace, Lady Sarah, with aplomb, says to the smug visage of Abigail, “you actually think you’ve won”; with certainty, us viewers have! Next: POTPOURRI OF WHAT TO SEE ON TV!